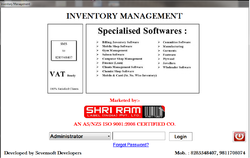 We are glad to inform that our company has started in an additional segment of developing Inventory Management Softwares. As per the needs and requirements of our customers, we are indulged in providing Inventory Management Software to our clients. These Inventory Management Software services are rendered by our team of dedicated professionals utilizing latest techniques and methodologies. We execute these services on time. You can contact for all your Billing/Inventory management needs. 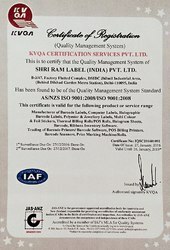 Quality management of Shri Ram Label (India) Pvt. Ltd. is now according to the Quality Management System Standard AS/NZS (Australia/New Zealand) ISO 9001 : 2008/ISO 9001 : 2008. Shri Ram Label (India) Pvt. Ltd. Is now ISO Certified Company, Contact for all your Barcode needs mob no. 9811708075, 9811708074, 8447710018.